I’ll never see Queen perform live. I missed my one chance. I recall the disappointment clearly, and it has not been forgiven. The year was 1984, my 15th on the planet, and my fifth as a rabid music fan. Queen, who along with the Beatles had settled in as my favourite band, were due to appear at the Sun City Superbowl in October. I was determined to go. I had to go. A school friend had even secured tickets, and one was for me. This depended, of course, on the largesse of my parents. Freddie Mercury — messenger of the rock gods — was unmoved by an international artistic injunction against playing in South Africa. My father, however, was equally unmoved by my pleas, and the answer was a strict “no”! Seven years later Freddie Mercury succumbed to bronchopneumonia, which commonly claims those in the latter stages of AIDS. That was it. A voice like no other — a voice that could traverse four octaves and reach every single member of an audience of thousands — was snuffed out. And I never got to see him sing live. Yes, I remember the day following the 24th of November 1991 clearly. Radio played Queen tunes up and down, TV broadcast more than the usual fare of past videos and eulogies, and so-called experts crawled out of the woodwork to lament what a gifted performer was lost to a disease barely understood. Everyone suddenly outed themselves as fans, and sales of Greatest Hits II, which all too co-incidentally had been released barely a month prior to Freddie’s demise, soared. Their label, EMI, took out this full-page ad in the December/January 1992 issue of Top 40 Music Magazine. A tribute concert and the obligatory post-mortem album were soon to follow. 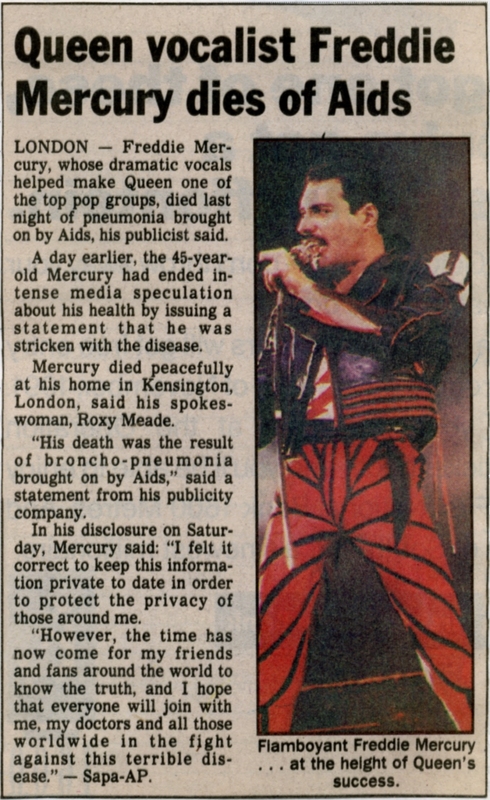 Condolences by and interviews of industry pundits who’d one never have expected to even know a Queen tune beyond the obvious hits all spoke of how unexpected, sudden and sad his death was while fellow band members John Deacon, Brian May and Roger Taylor tried to spin the story that they, themselves, hadn’t known of his illness “until recently”. Hello? Hadn’t anybody noticed how gaunt and sickly Mr. Mercury appeared in the videos lifted from the Innuendo album released as recently as February of that same year? Had we all but forgotten the rumours in the English tabloids spanning back to the period of 1989’s The Miracle album (and before) as well as the all-too-conspicuous lack of a supporting tour? I didn’t buy the story then, and I still ain’t buyin’ it – perhaps, in my own naïve way it was merely a misguided effort to suppress the inevitable, hoping that it’s just a temporary glitch. He’ll be okay, and if there’s anything wrong we’ll hear from him. That policy did continue, for another 24 hours, until he passed away on the 24th of November 1991. Freddie Mercury’s legacy is astounding, and his story is well known. 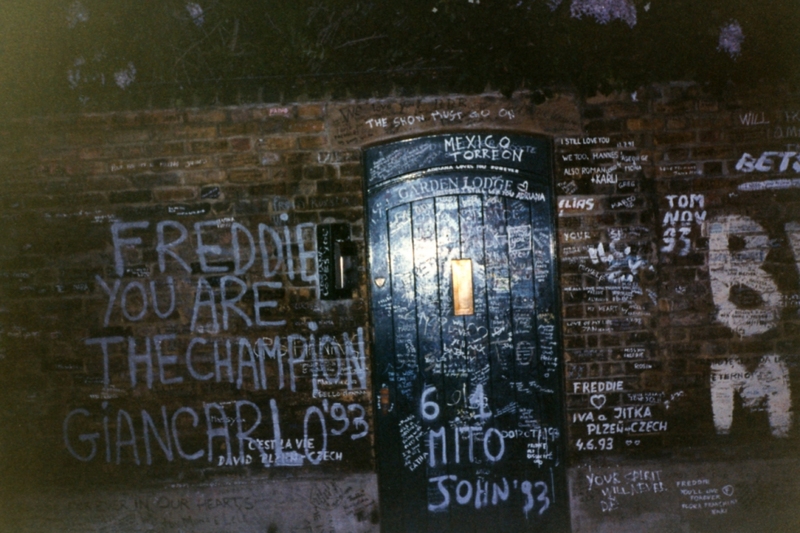 Born Farrokh Pluto Bulsara in Zanzibar in 1946, Freddie was educated in India and England. He learned to play the piano early (although he composed most songs on guitar), and after a succession of failed school bands, he met Brian May and Roger Taylor, then members of a band called Smile. He changed the band’s name to Queen, which if not a direct reference to homosexuality, was certainly a nod at his sexual ambidextrousness. He also changed his surname, by deed poll, to Mercury, and thus became the frontman for a band that would go on to sell more than 300 million records worldwide. This number is awe inspiring, and it ranks Queen as one of the top five bands of all time. That said, the band was never as easy to categorise as, say, contemporaries like The Who or Led Zeppelin. Their influences were too broad; they were theatrical rather than proggy — largely because they had Freddie’s inbuilt showmanship and sense of humour to keep them on the straight and narrow. I use the term “straight” in the context of Freddie Mercury, erhmm, loosely. He was never quite a gay icon, but rather a transitional figure between the closeted years that prefigured the AIDS era, and our own, more open time. Like Liberace and Elton John, Freddie was certainly bent, but never properly out. He dated women — most notably Mary Austin, the love of his life and to whom he left the bulk of his assets — but was in a long-term relationship with Jim Hutton when he died. He was true a Dionysian, or he came off as one. The truth seems to be a little more complicated. 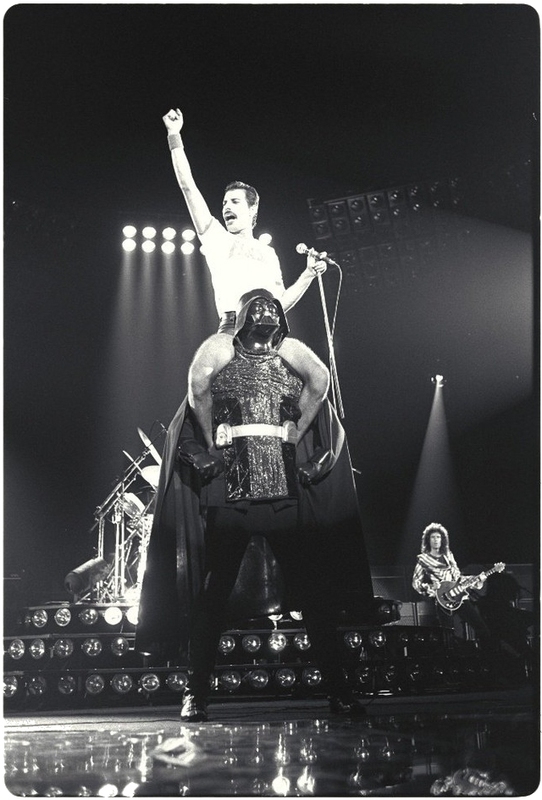 Painfully shy and terribly quiet in company, Freddie was a showman on stage only. He was never the loudest guy in the room — unless that room happened to be Wembley Stadium. He was a performer, and he lived his life to be extroverted on stage, and on stage alone. The idea of Freddie Mercury mumbling is almost unimaginable, but he was a mumbler supreme. Twenty years after his death, Queen’s legacy has dimmed not at all. Bohemian Rhapsody and We Are the Champions must be two of the most played songs on radio and in stadiums the world over. Since Freddie passed away, the band has sold almost 20 million records in America alone. The We Will Rock You musical continues to delight audiences the world over. Freddie Mercury is repeatedly polled as the greatest rock vocalist ever, and Queen’s set at Live Aid in 1985 is widely regarded as the greatest rock performance of all time. While I’m in two minds about whether Brian and Roger aren’t milking every last drop out of the deceased cash cow or are honestly and sincerely doing their level best to keep Freddie’s legacy alive, Queen’s longevity is beyond dispute. The band is an inviolable part of Western culture, and as universal a brand as it’s possible to have in music. Footnote: I can’t wait to see what Sacha Baron Cohen does with the role of Freddie Mercury in the forthcoming biopic, “Borat” being a far more intriguing choice than the equally colourful Johnny Depp who was rumoured to portray him some years back. Disclosure: Much of this blog posting was lifted straight from an article by Richard Poplak that appeared on Daily Maverick — all the more shamelessly so and guilt-free because the experience, and indeed much of the sentiments, happen to echo my very own. Photo credits: The personal picture archives + Google. Scans by yours truly. This entry was posted in Music and tagged anger, life's greatest disappointments, murder-death-kill. Bookmark the permalink.